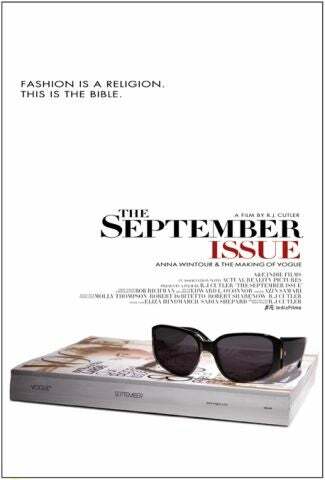 There is something almost touchingly prelapsarian about The September Issue, R. J. Cutler's documentary about the making of the biggest ever issue of American Vogue. The September, 2007, Vogue, which sold 13 million copies, weighed nearly five pounds, and its 840 pages made it the single largest magazine ever published. Seven-hundred and twenty-seven of those pages were ads. When publisher Tom Florio exhorts the magazine's advertising sales team to "sell Vogue the brand like it's never been sold before," you feel it: this is what things were like when economic growth and consumer spending were lockstep in one upward trend, and magazines like Vogue could reliably put out Our Biggest Issue Ever, every year. You also feel it when Wintour is filmed with her deputy, Sally Singer, at a retailer luncheon the magazine has convened. Retailers are nervous about certain of the things they've seen on the fall runways, and they rely on Wintour as a kind of emissary to the design world; when Singer prompts her boss to share their "good news," Wintour tilts her head and reports that she has spoken to "Mrs. Prada" several times, and that she has agreed to "reinterpret" certain of her runway looks in a more wearable silk-mohair blend, instead of the wool-mohair she had shown on the catwalk. The assembled tableful of executives from Saks and Bergdorf's practically coo with appreciation. After that decree is handed down to such a happy reception, Burt Tansky, the president and C.E.O. of Neiman Marcus, starts to ask Wintour a long question about delivery schedules. Designers, it seems, are making late and infrequent deliveries, which retailers feel cost them sales; customers want what's new right now. Tansky uses the phrase "demand outstripping supply" several times. It is a shocking moment: it's as if the incredible glut of oversupply, the $3,000 handbag bubble that rose through the market during the years of easy credit and burst last fall in a mess of steep discounting and steeper layoffs, had risen up, taken over Tansky's body, and thunderously demanded to be fed. Wintour's response is equally shocking: given her magazine's role in pushing the culture of consumption, the culture of "aspirational" consumerism and "It" bags, one might expect Wintour to tell the titans of retail that she will speak to these tardy designers and tell them what's what. But instead she dresses down Tansky, giving him a politician's non-response about how she "hears what he is saying" and that it boils down to a problem of "editing." She says some of the younger designers have trouble editing their collections down, and she will see what she can do. Never mind that "editing" is almost the exact opposite of Tansky's concern; Wintour gets up from the table and leaves. And one is confronted with the surprising sense that, whether or not she knew it at the time, Wintour was on the right side of that issue. There are a number of surprising things about The September Issue, which I finally saw last night. Although Wintour comes across as fairly warm and forthcoming, the camera cannot hide her staff's authentically fearful reactions to her presence; when Wintour is perusing photo spreads with her art director, she moves slowly and deliberately down a long bench, looking at photos one by one. When she approaches a young assistant who is lingering over, or perhaps just straightening, one of the shots, Wintour, without moving a muscle, says quietly, "Excuse me." The girl jumps out of Wintour's way like she's been bitten, and Wintour continues down the line of pictures without breaking stride. Apparently, there also must be a rider in Patrick Demarchelier's contract about being able to shoot in beautiful locations, because we witness the production of one of those terrible, jumping, grey-background editorials of which Vogue is so very fond, and it doesn't take place at Milk Studios. Demarchelier, Caroline Trentini, Coddington, and the rest of the team are whisked away to a beautiful modernist house on a wide-open expanse of land; in the living room, a grey backdrop has been hung, and what emerges is a shoot which gives no inkling of its geographical origin. The location fees alone for that shoot boggle the mind. The adversarial but respectful relationship between Grace Coddington, Vogue's top stylist, and Wintour is also explored. While other fashion editors crumble under Wintour's reproach — Edward Enninful says after a styling critique where Wintour rejects nearly every look he has put together that he wants to kill himself — Coddington fights, both in her editor's office and via backchannels. (She's always using the documentarians to try and find out how her spreads are faring — gaining pages, losing pages, or holding steady — in the layout room.) Wintour seems to respect Coddington all the more for her willingness to scrap; it's as though, like a good boss, she wants to be challenged. When cover subject Sienna Miller steps into the scene, an instructive juxtaposition between celebrities and models is created. (We also see Raquel Zimmerman, Caroline Trentini, Coco Rocha, and numerous other no-name girls, do their thing; during a couture shoot in Paris, Zimmerman carefully eats a fruit tart the size of a saucer, while a distressed makeup artist looks on in preparation to re-perform her handiwork.) Sienna is full of life, giddy and excited and seemingly fun — also a canny business woman: she makes sure to introduce her designer sister, Savannah, to Wintour and the Vogue team — and the models are more subdued; there's a care taken in their movements. When a source makes the argument that women like Sienna got the idea to be models because they saw the supermodels of the late 80s and early 90s take over the fashion world, and grew to covet Linda Evangelista and Christy Turlington's beautiful ubiquity, it's hard not to agree. Sienna poses and jumps and mugs for the camera like an actress trying to look like a bombastic 80s model, as if by sheer enthusiasm she could will a beautiful picture into existence, and consequently her shots take all manner of Photoshop trickery — fake backgrounds, a head from one shot Frankensteined onto the neck and shoulders from another — to finesse. Raquel and Coco know just how to move a hand or a shoulder to set off the lines of the garment, and they work at it until the shot is just right. Coddington says at one point that she wouldn't care if she never saw another celebrity again in her life; and after seeing the focus that Raquel brings to that couture shoot — which ended up in the October, 2007, issue — you can't help but kind of agree. The film is a well-studied evocation of all the hard work that goes into producing a magazine; unfortunately, the beauty and editorial sides are a little under-represented (we briefly see a spread featuring the makeup artist Pat McGrath in the layout room, and Wintour spends one scene looking bored while a junior editor goes over story ideas for the issue. "We're focusing on the eye, because I think eyes are a real concern for all women, they're the first thing that starts to really show age, even girls in their 20s worry about their eyes," says the editor. It's like watching a need being manufactured.) Wintour emerges as a surprisingly insecure. "Just because you like to put on a beautiful Carolina Herrera dress or a pair of J Brand blue jeans instead of something basic from Kmart doesn't mean you're a dumb person" is the kind of pre-emptive defense that says more about the defender's perceptions of the attack than anything else. "People are scared of fashion — because they're frightened or insecure, so they put it down...There is something about fashion that can make people very nervous." The idea that people only hate what they do not understand — implicit in which is the idea that there are no valid grounds on which to criticize Wintour, her magazine, or the fashion industry, just hurt feelings — is about the oldest trick in the book. And it comes off like Wintour, with her intellectual heavyweight family, is shadow-boxing. Who seriously pretends these days that appreciating good design and being smart are incompatible? Wintour's eagerness to defend herself on the issue is telling.